Your letter and Dr. Kimmel's5 arrived today. This is Sunday and I cannot see Dr. Hart6 - queer name for a heart specialist, but that is his name. He was abroad when Douglass7 was here8, or I would have chosen him before Dr. Patterson9. I have already talked to Dr. Garbat10. I will get Dr. Hart to write a letter of advice either to you or Dr. Kimmel. In the meantime, I want you to thank Dr. Kimmel for his very clear and definite statement of Roscoe's11 original condition12 and present improvement. 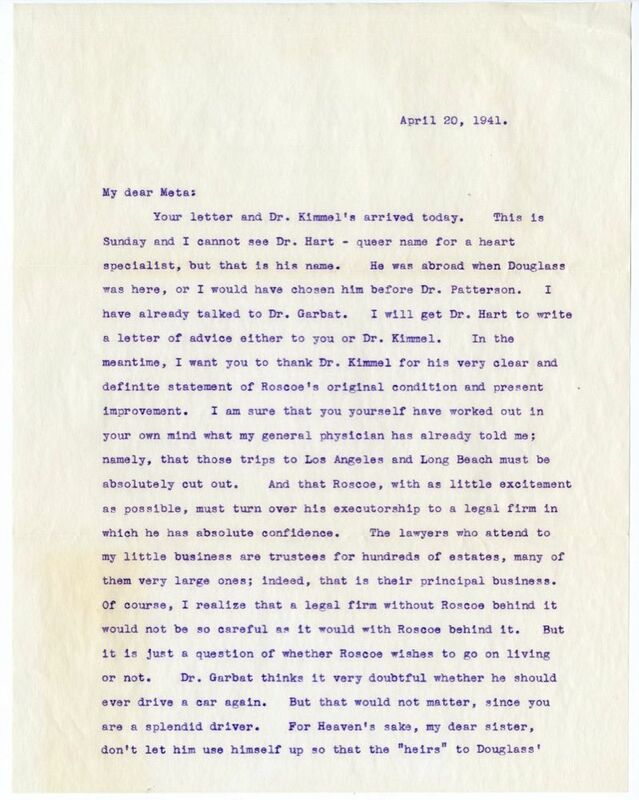 I am sure that you yourself have worked out in your own mind what my general physician has already told me; namely, that those trips to Los Angeles13 and Long Beach14 must be absolutely cut out. And that Roscoe, with as little excitement as possible, must turn over his executorship to a legal firm in which he has absolute confidence. The lawyers who attend to my little business are trustees for hundreds of estates, many of them very large ones; indeed, that is their principal business. Of course, I realize that a legal firm without Roscoe behind it would not be so careful as it would with Roscoe behind it. But it is just a question of whether Roscoe wishes to go on living or not. Dr. Garbat thinks it very doubtful whether he should ever drive a car again. But that would not matter, since you are a splendid driver. For Heaven's sake, my dear sister, don't let him use himself up so that the "heirs" to Douglass' estate will get a few more dollars out of it! I am writing this hastily to get it off on the quickest possible mail. My thoughts for the last few days have been scarcely anywhere but with you and Roscoe. The situation simply makes me short of breath. For instance, yesterday I poured a very strong ammonia tonic into my eyecup and washed my eye with it, with the result that I have had to keep wet cloths on it today. P.S. Meta, dear, I have ordered a delightful adventure book15 for Roscoe, by Neville Shute16. That is not his real name. He is a very important officer in the English air service, and he wrote this book when he was laid up a short time from injuries in the service. I read it when I was in the hospital at Christmas time, with great pleasure. It's very modern, the way the kids talk (the air kids, I mean). But it's splendidly worked out, and the little pictures of the English public men which come into it are so much like those I have myself known. Maybe he will like you to read it to him. I know you will both love the Dutch sea captain who comes in at the latter part of the story, and the diver who does down to examine the lost submarine. Think of me when you chuckle. Document is two leaves, typewritten on recto of each leaf only. 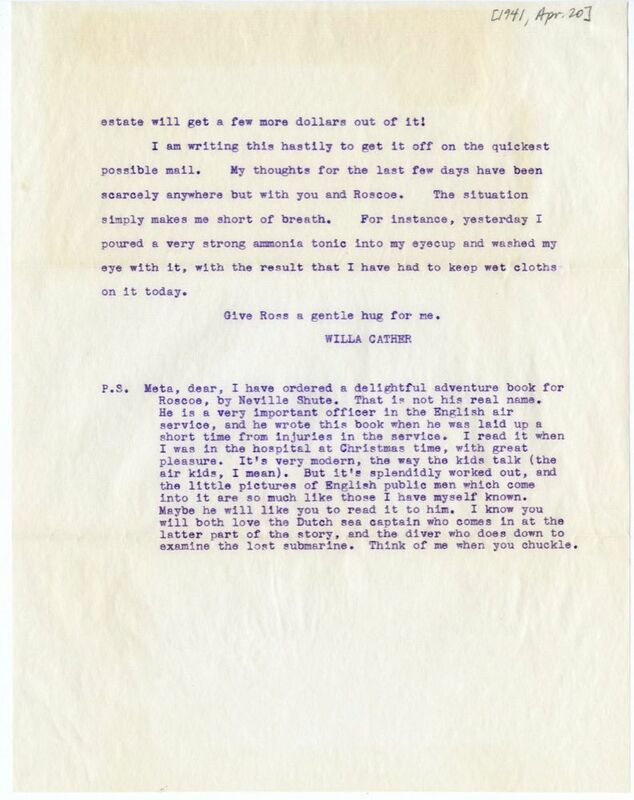 Includes an enclosed typed letter to Cather from Joseph E. Tillotson MD and a newspaper clipping. Includes one envelope, typewritten. 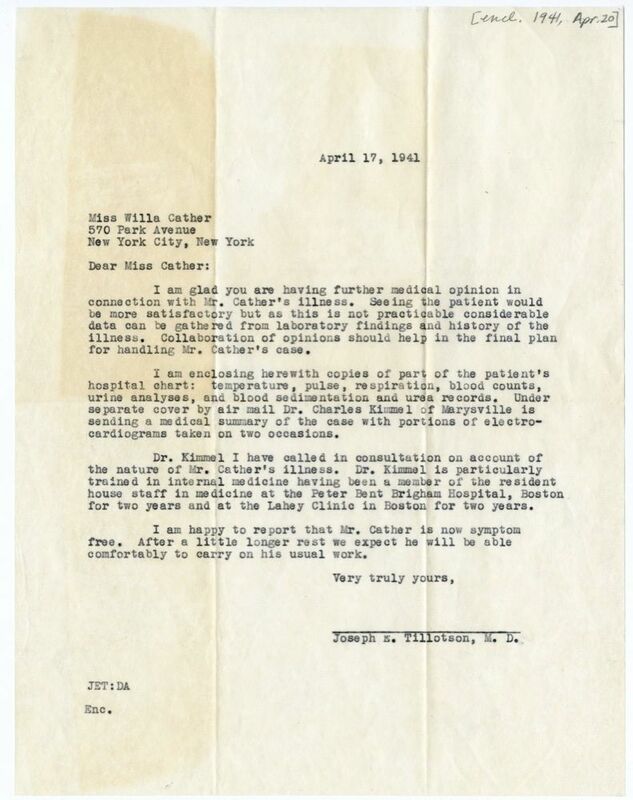 Includes one enclosed typed letter to Cather from Joseph E. Tillotson MD which details Roscoe's medical condition. Includes a newspaper clipping about the death of Oliver Wendell Holmes. 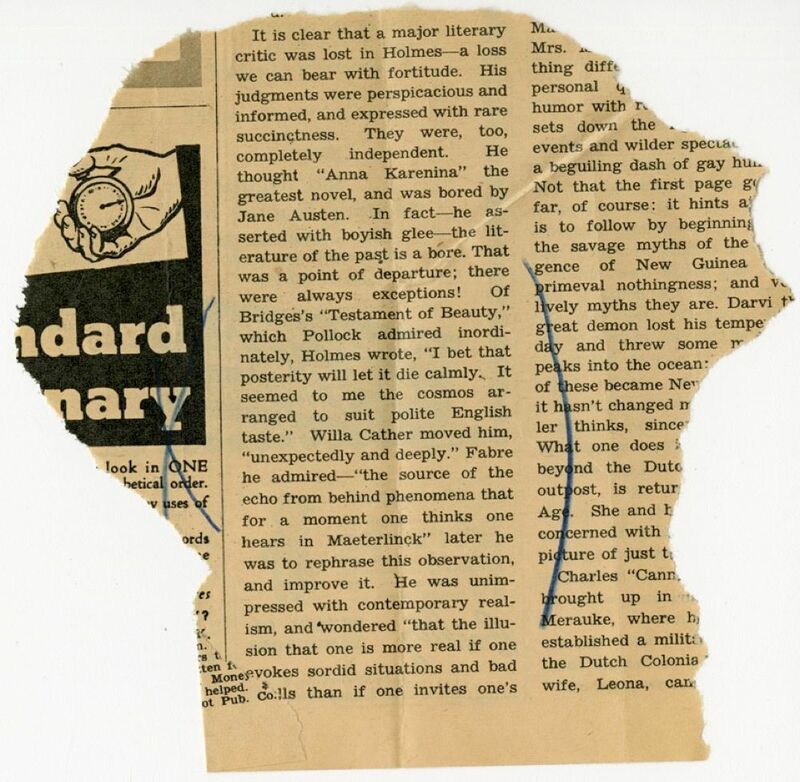 Cather had made a mark around the section where it quotes something he had said about Cather. Douglass Cather visited New York and saw Dr. Patterson in December 1937. 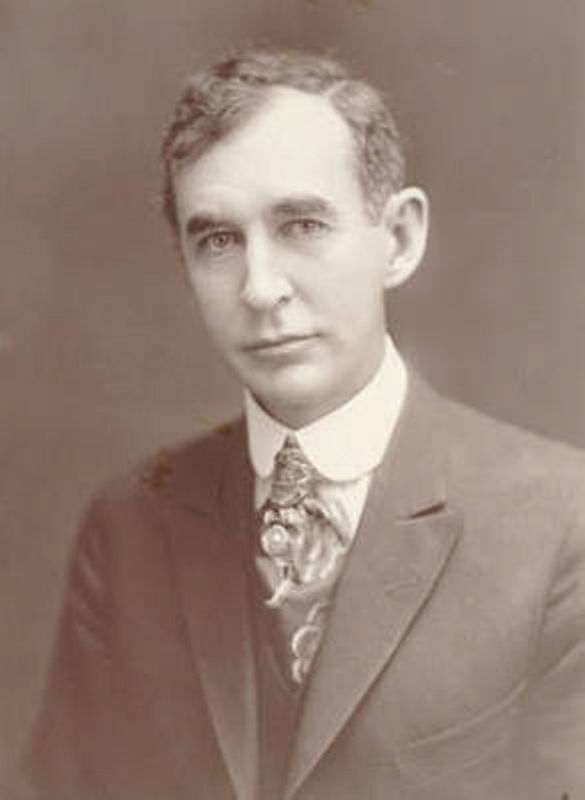 Kimmel, Charles B. (1906-1961). American physician. Born in Ohio, Charles Kimmel moved to Marysville, CA, in 1939 after completing his medical residency in Boston and worked at the Marysville Medical Clinic. 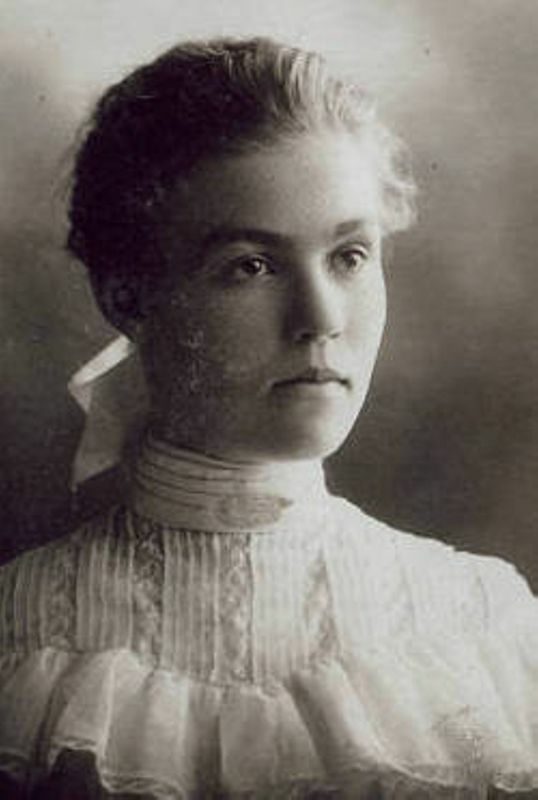 Charles Kimmel provided care for Roscoe Cather in the early 1940s. 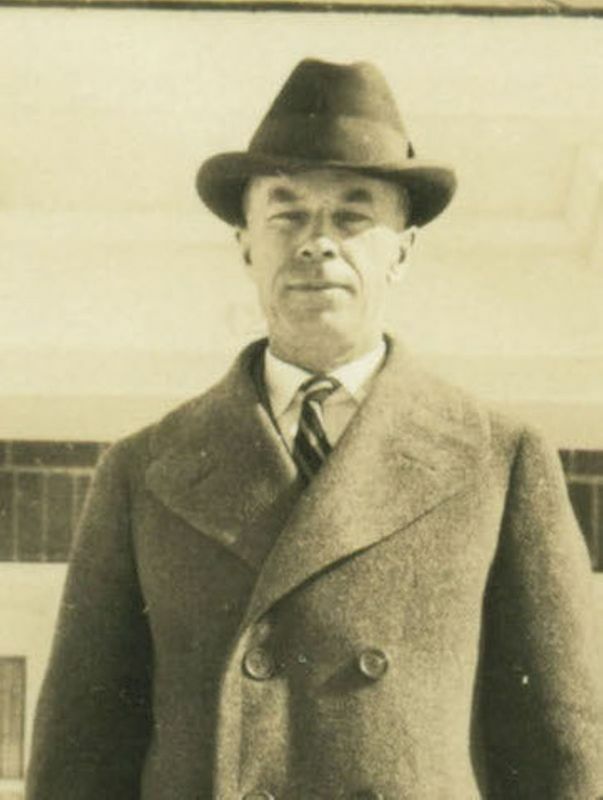 Norway, Nevil Shute (1899-1960). British writer and aeronautical engineer. Nevil Norway spent the early part of his career as an aeronautical engineer and in 1931 formed his own aircraft construction company, Airspeed Ltd., which became a major aircraft supplier for Britain at the outbreak of World War II. While working as an engineer, Norway began writing in his spare time, but did not fully commit to professional writing until 1938, when he resigned from his company. Over the course of his writing career he published twenty-three novels, mostly with Heinemann Ltd., and enjoyed commercial success both in Britain and America. Four of his best known works are: Pied Piper (1942), A Town Like Alice (1950), Requiem for a Wren (1955) and On the Beach (1957). His later novels were especially critical of the British government and in 1950 he emigrated to Australia.